(Nanowerk News) Findings from a physics study by a Kansas State University researcher are helping scientists accurately predict the once unpredictable. Yujun Wang, research associate with the James R. Macdonald Laboratory at Kansas State University, and Paul Julienne at the University of Maryland, looked at theoretically predicting and understanding chemical reactions that involve three atoms at ultracold temperatures. 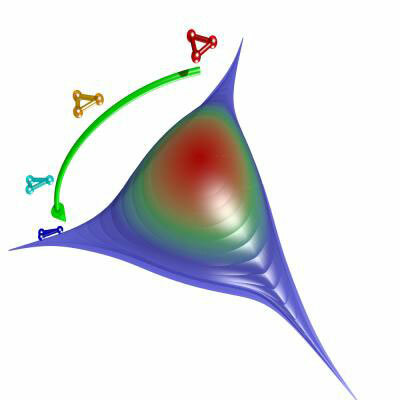 Their findings help explain the likely outcome of a chemical reaction and shed new light on mysterious quantum states. The scientific journal Nature Physics recently published their findings in the article "Universal van der Waals Physics for Three Cold Atoms near Feshbach Resonances". In the theoretical study, Wang and Julienne developed a robust yet simple model that successfully predicts what happens in atomic reactions at ultracold temperatures. Their model, which is considered the best available, accounts for spin physics of the atoms as well as the van der Waals force — the attractive long-range forces between the forming molecules. "For a long time there has been the belief that this kind of reaction in three or more particles is too difficult to predict because the interaction is so complicated," Wang said. "Now, this research has shown consistent observations that indicate and imply that theoretical prediction is possible." These findings can guide research in chemical engineering, molecular physics and other fields because the model gives scientists a largely accurate idea of how the atoms will bind to form a molecule, Wang said. Additionally, their work may help scientists understand the Efimov effect. The Efimov effect, which was first predicted in the early 1970s, is what happens when two atoms that normally repel each other become loosely bound when a third atom is introduced. The result is three atoms that all stick together despite trying to repel each other — a reaction that defies conventional knowledge. "It's a very bizarre mechanical phenomenon in quantum mechanics that cannot be understood using the classical model of physics," Wang said. "The details of the Efimov effect are seemingly random and therefore complicated to study. But, because we showed that our atomic model and calculations can pretty accurately predict the position of such molecular states, we have new knowledge that may help us bypass those old barriers."